The smallest European birds are the Goldcrest and the closely related Firecrest. While Goldcrests are present in Arran throughout the year, the sighting of a Firecrest in a garden in Whiting Bay on 17 November was confirmed by the Clyde Rare Birds Panel and was a first for Arran. Goldcrests breed in Arran and throughout Europe. On the other hand, Firecrests breed mainly in central and southern Europe. The first breeding record in the UK was in 1962. Breeding in the UK is currently restricted to southern England. 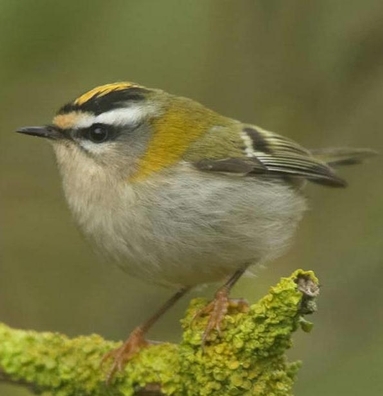 Firecrests appear in the UK rarely as spring and autumn passage migrants. As well as this one reported in Whiting Bay, there were only three other Firecrests reported in Scotland this autumn: one each at Fair Isle, Torness and St. Abbs Head. In south west Scotland it remains a real rarity: one in Ayrshire a few winters back was only the third county record. Compared with the far more familiar Goldcrest, the Firecrest displays considerably more striking plumage characteristics. Most noticeable is the striking white supercilium ( a stripe above the eye) contrasting with a bold black edge to the fiery orange crest, and a black stripe through the eye. The black-white, black-white, double eye stripe effect is a conspicuous feature on so small a bird. In the Whiting Bay garden, it was these features that caught the attention of the person, who reported the Firecrest.